Disclaimer: I've been informed by Salesforce that this an exceptional case for functionality is still being refined and will likely be exposed broadly in a future API version (#SafeHarbour). Although perhaps not in this exact form. As with all undocumented API features they could disappear at any time in a future release. My blog disclaimer also applies. In putting together an answer to a Salesforce StackExchange question I came across something odd with the Force.com IDE source code. The question needed a way to find details about installed packages. 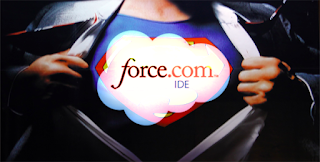 What makes the Force.com IDE so special that it can run SOQL queries that other API users can't? This is later combined with the API version to create the callOptions header. So what if we use the same string when we establish our Session using the Partner API and then on subsequent calls? The FuseIT SFDC Explorer supports setting the Client Id on the login New Connection screen and on a saved connection string. I'll do some more poking around as time permits to see if there are any other hidden treasures.